This apple cider vinegar detox drink helps cut down on bloating because of the combination of the lemon and apple cider vinegar. And it tastes amazing! This apple cider vinegar detox drink is a great alternative to plain water or the expensive “healthy” drinks we love! I really believe that this drink helps cut down on bloating because of the combination of the lemon and apple cider vinegar. I’ve been drinking it every day and I love the extra boost of energy that comes along with it! Read more about the benefits of ACV here. 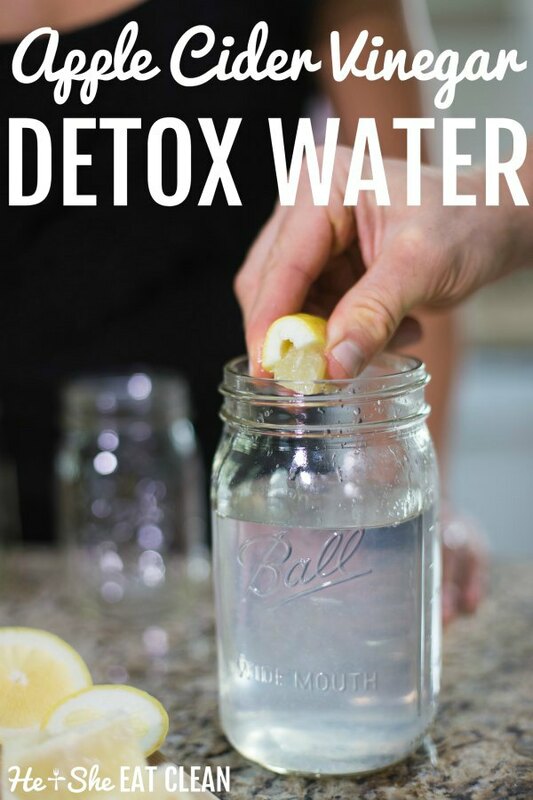 This is a detox water that you drink along with your clean, healthy meals…it is not designed to be a full-fledged cleanse, rather it should be used to reduce bloating and water weight. It’s perfect to drink when you are about a week away from a big event. If you are interested in more information on living a healthy lifestyle, check out our FREE Two Week Healthy Living Challenge! Make sure you check out our additional flavored water recipes below. Add all ingredients to a cup and mix. We usually put ours in a blender bottle!